Growing up on role playing games like Chrono Trigger and Breath of Fire, I have become accustomed to “old” graphics and can respect any developer’s decision in taking this route. Developed under the fingertips of indie developer – Dumb and Fat Games, Phantasmaburbia seems very at home aesthetically with older RPG titles but revolts from the considered RPG norm in unique ways. Let’s see how this spooky tale speaks in its own afterlife. 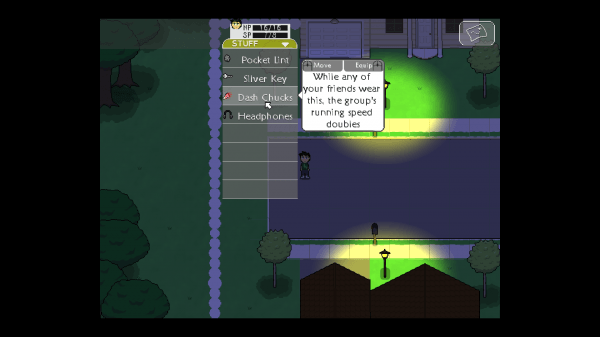 Phatasmaburbia provides an in-depth story that is lacking in many indie titles. I must admit in the very beginning I was completely skeptical of story’s direction regarding an ancient samurai warrior ghost in a modern world, but somehow each character’s background falls into play. 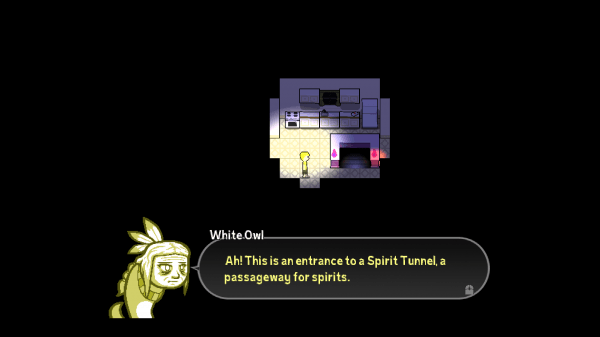 There are four playable characters who meet ghostly apparitions that assist them through defeating the evil upsurging their small town called Owl Creek. When finding each character’s ghostly counterparts, you come to realize that each ghost has unfinished business or purpose that retains them to the material world. One ghost in particular is of a small child who appears more as a lost spirit. Learning his true story and his connection to the growing evil is both heartbreaking and liberating once Phatasmaburbia comes to a close. The developer did well to create a compelling story that keeps an audience readily asking questions to continue playing in hopes to find out most of the answers. Stemming from an in-depth story comes extensive gameplay. Creator Greg Lobanov mentions that players can traverse the title in approximately 8 hours without experiencing extra content. My experience of finding some notable extras lasted me just over 10 hours. Even though 8-10 hours may not seem like a lot, you will experience a game without loaded cut-scenes or the necessity to mindlessly grind to level up. Greg explains that he has taken all of his knowledge from past RPGs and applied it to this title to create a game that exercised how he felt RPGs should be played. He wanted to eliminate the need to level grind, purchase items, and deal with non playing characters. Though Phantasmaburbia has been cut clean of some role playing attributes, it still maintains the barebone foundation with user interface, equipment, and turn based combat. The interface is easy to navigate as it works off of a drop down menu from the top of the screen. A player can access a character’s inventory by left clicking their icon from the drop menu. Without changing screens, the items will display below the character’s icon and ask for a right mouse click to equip the item. Right clicking the character icon from the drop menu will bring up the character’s learned abilities section where new abilities can be switched with active ones. On the upper right hand of the screen is the map icon which opens a map of the current area (sometimes a map must be required to learn the area layout). Equipment can be gathered by opening chests, scrounging through garbage cans, killing spirits, or ransacking shelves. All items are one of a kind and have a special enhancement that aids its wearer. Such enhancements include elemental damage reduction, attribute increase, 25% chance of causing negative affect, or even party speed doubled. Rare items can be found by doing side quests and killing special foes. After becoming acquainted with a ghostly companion, each character learns an ultimate move that provides a special effect during battle. For instance, the first character’s ghost is Moshi who is an ancient samurai ancestor of the family. He aids the player with a special ability that not only slices the enemy with a katana strike but also heals a small portion of the party’s health. 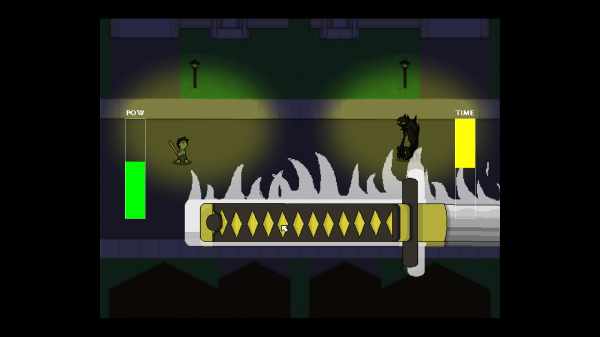 In order to maximize the efficiency of the ability, the player must left click with the mouse and move the katana in an up-and-down motion to build up POW (Power). Maxing out the POW will provide the greatest effect for the skill. YOU ARE THIS BOSS FIGHT’S ONE MILLIONTH PLAYER! SELECT “ABORT” TO QUIT THE GAME NOW AND COLLECT YOUR FREE GIFT CERTIFICATE TO ONE (1) MEAL AT THE OLIVE GARDEN!!! Boss battles that occur within the running storyline provide more interaction in the midst of battle. When battling a dog melded with an earth spirit, you must interact to stop the creature’s special attack. 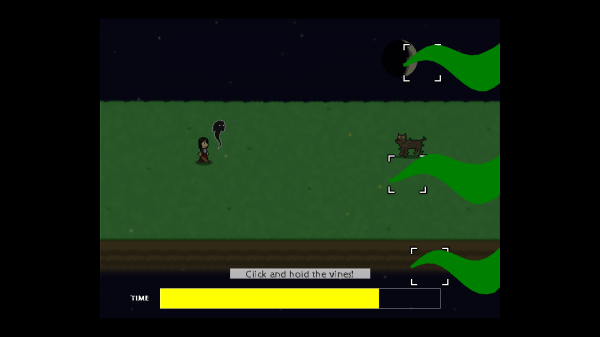 Vines will begin to reach across the screen, and you will have to left click the vine and follow in its course to wither its growth. However, three vines will grow at different rates, so be sure to choose the faster growing one first. While the story is linear, you may take on any dungeon the moment your party is formed. There is no particular order set forth so choosing what element to go after is completely up to the player to decide. The interesting notion with this is that not all dungeons can be accessed in one game session. The evil being in the title seeks the dungeon opposite to the dungeon’s element type your traverse. Therefore, you are connected by a ying-yang concept with nature spirits. So in order to experience all of the dungeon types, you will need to start a new game or replay a beaten game in “New Game +”. New Game + is an aspect that I believe Greg Lobanov enjoyed in RPGs as he made it available. By starting a new game with a saved file, you can utilize some equipment from a previous game as well as receive a leveling boost to speed up playing time. This is a great way to get a chance to experience all of the little niches that you weren’t able to the first time through (Creator Battle, Headless Horseman, or Stay Puft Marshmellow Man – just some things to search for). What is a game without glitches or bugs? Sadly, I have encountered such a couple glitches that resulted in a endless game state as well as a game crash. During my battle with the water nature spirit “rabbit”, I began attacking as normal. 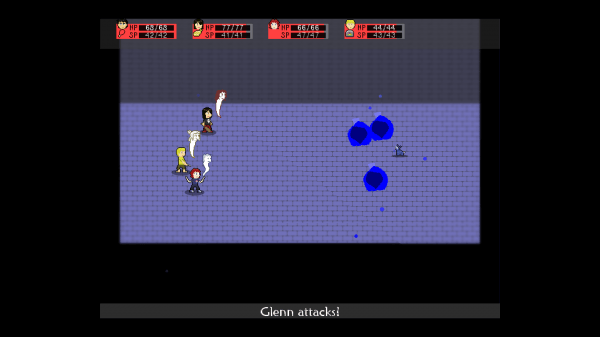 Glenn, my first character, had jumped off screen to attack and did not return. Quitting to the main menu did not resolve the issue as the same bug reoccurred. By exiting the game entirely and playing from the last checkpoint, I was able to overcome the glitch. The second glitch that I encountered occurred when clashing an ice element and fire element. With one melting ice and the other forming ice, I encountered a crash when both collided with each other – lesson learned. While neither lacking nor impressing, character’s audio in dialogue are the equivalent of adults speaking in Peanuts. A small blurp of incomprehensible gibberish is given to the player that adds some comical effect but soon loses its flavor. I believe adding full audio for dialogue would go against Phatasmaburbia’s theme of being a different style of RPG. On the other hand taking this audio out would leave a small void of player’s expecting more. So in the end this blurp of gibberish fits the title well. Keeping dialogue on the brain, the incorporation of character portraits provides a greater association to players. Not only are the portraits available when the dialogue appears, but they also present an acting emotion from the voicing character. At least you will know who is speaking the gibberish when any dialogue appears. Sprites encompass the entire make-up of an old school RPG, and Phantasmaburbia excels in variety rather than quality. Character sprites including the ghostly counterparts could have some work done to them. During the naming process of the main characters, I would not have known the gender of certain characters if it wasn’t for the “Don’t Care” button (keep pressing “Don’t Care” and see what silly names await you). As for the friendly ghosts, I did not mind their appearance until my wife asked me why there was floating sperm with people’s heads in the game. Needless to say that situation scarred a part of the game’s experience. 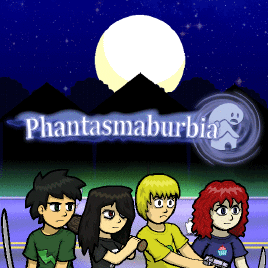 Phantasmaburbia has excelled in creating a fast paced RPG that requires little experience to get the hang of. Even though a lot of normal RPG elements have been mercilessly cut away, the end result provides a quality title with a price that won’t use a menacing stare to turn you away. Some aspects of the title could use finer tuning due to bugs encountered, but the in-depth story alongside extra playable content yields a worthwhile experience.